The second Agriculture College of the state will come up at East Kameng district – Pema Khandu, CM, Arunachal Pradesh. 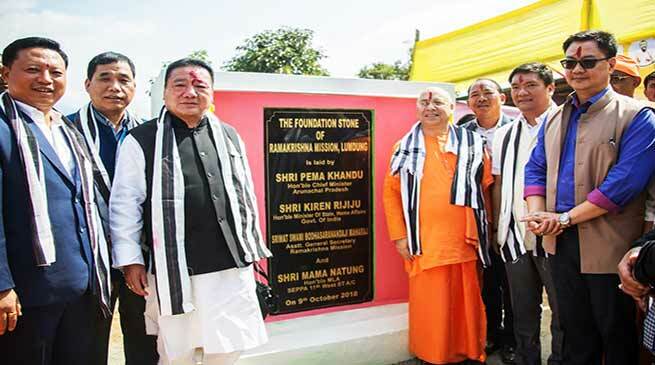 Chief Minister Pema Khandu today laid the foundation stone of the third Rama Krishna Mission School of the state here in presence of MoS Home Kiren Rijiju, Home Minister Kumar Waii, Asst General Secretary of RKM Swami Bodhasarananda including other dignitaries. Khandu also announced to establish the second Agriculture College of the state at East Kameng district during his speech at the foundation laying ceremony. Chief Minister said the two institutes will not only benefit East Kameng district but all the neighbouring districts. Thanking the efforts put up by local MLA Mama Natung and contribution from the members of RKM for establishment of the school, he appealed all the MLAs of East Kameng, West Kameng and Tawang district to contribute annually from their MLALAD for the development of the RKM School. He also made similar appeal to the local business community and contractors to part with their earning for the development of school. Responding to the demands from RK Mission for the development of the school, Chief Minister assured full support of the state government stating that RKMission have tremendous contribution towards development of human resource in the state. Responding to another memorandum from local MLA, Khandu assured his full support for all round development of the constituency. Chief Minister said the opening of RKM School and Agriculture College in the picturesque East Kameng district will not only uplift the education scenario but will boost tourism and economic activities. He therefore urged the locals to cooperate with the administration for its speedy establishment without creating hindrances on compensation issues particularly for the Agriculture college. MoS Rijiju, Kumar Waii, Dirang MLA Phurpa Tsering, Chairman of RKM Lumdung Hari Natung also spoke on the occasion. Also present were Advisor to CM Japu Deru, Thrizino MLA Kumsi Sidisow and others.